You probably thought the cheetah is the fastest animal in the world. Well the Peregrine falcon can soar to the speed of 242 miles per hour! That’s faster than a race car! These falcons are carnivores which means that they eat only meat. 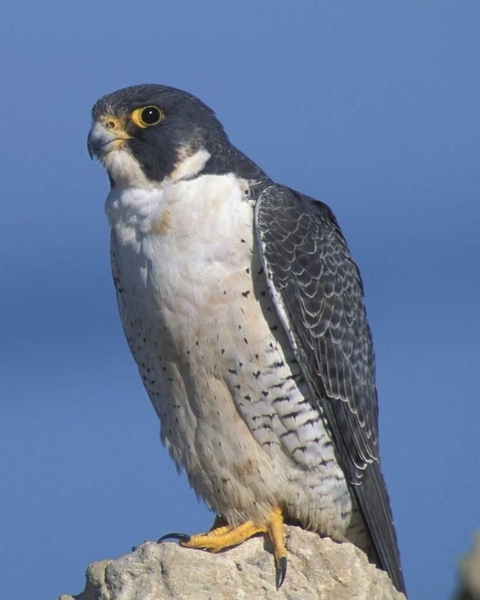 The Peregrine falcon preys on medium size birds, small reptiles, rodents, or even insects. The body length of this falcon is about 13 to 23 inches long. Their wingspan is about 29 to 47 inches long. The female sometimes measures 30% longer than the male. Peregrine falcons have have long pointed wing. The wing color of an adult is usually bluish black with a little bit of grey. The belly and the legs are golden with black spots, and the talons are yellow with black claws. The beek is some times tan or yellow or mixed with a black or grey tip. You can find the Peregrine in large cities were tons of rodents go to feed on garbage or in coastal areas because of small birds.